The Histogram dialog shows you information about the statistical distribution of color values in the active layer or selection. This information is often useful when you are trying to color balance an image. However, the Histogram dialog is purely informational: nothing you do with it will cause any change to the image. If you want to perform a histogram-based color correction, use the Levels tool. The “Histogram” dialog is a dockable dialog; see the section Paragraaf 2.3, “Koppelen van dialoogvensters” for help on manipulating it. from the image menu: Windows → Dockable Dialogs → Histogram. from the image menu: Colors → Info → Histogram. In the Windows menu, there is a list of detached windows which exists only if at least one dialog remains open. In this case, you can raise the “Histogram” dialog from the image-menu: Windows → Histogram. In GIMP, each layer of an image can be decomposed into one or more color channels: for an RGB image, into R, G, and B channels; for a grayscale image, into a single Value channel. Layers that support transparency have an additional channel, the alpha channel. Each channel supports a range of intensity levels from 0 to 255 (integer valued). Thus, a black pixel is encoded by 0 on all color channels; a white pixel by 255 on all color channels. A transparent pixel is encoded by 0 on the alpha channel; an opaque pixel by 255. For RGB images, it is convenient to define a Value “pseudochannel ”. This is not a real color channel: it does not reflect any information stored directly in the image. Instead, the Value at a pixel is given by the equation V = max(R,G,B). Essentially, the Value is what you would get at that pixel if you converted the image to Grayscale mode. For more information on channels, please consult the Paragraaf 1, “Soorten afbeeldingen”. The active layer name is shown at the top of the dialog. For RGB and Grayscale images, this shows the distribution of brightness values across the layer. For a grayscale image, these are read directly from the image data. For an RGB image, they are taken from the Value pseudochannel. 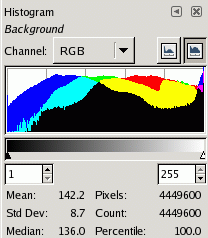 For an indexed image, the “Value” channel actually shows the distribution of frequencies for each colormap index: thus, it is a “pseudocolor” histogram rather than a true color histogram. These only appear for layers from RGB images. They show the distribution of intensity levels for the Red, Green, or Blue channels respectively. This shows the distribution of opacity levels. 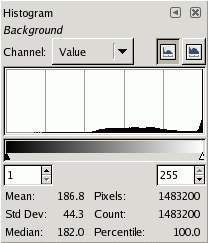 If the layer is completely transparent (alpha = 0) or completely opaque (alpha = 255), the histogram will consist of a single bar on the left or right edge. Figuur 15.20. Combined histograms of R, G, and B channels. This entry, only available for RGB layers, shows the R, G, and B histograms superimposed, so that you can see all of the color distribution information in a single view. Figuur 15.21. 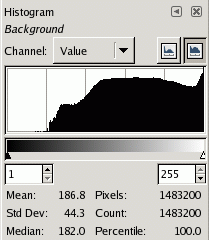 The histogram shown at the top, changed to logarithmic mode. These buttons determine whether the histogram will be displayed using a linear or logarithmic Y axis. For images taken from photographs, the linear mode is most commonly useful. For images that contain substantial areas of constant color, though, a linear histogram will often be dominated by a single bar, and a logarithmic histogram will often be more useful. Figuur 15.22. Dialog aspect after range fixing. Click and drag the pointer across the histogram display area, from the lowest level to the highest level of the range you want. Click and drag the black or white triangles on the slider below the histogram. Use the spinbutton entries below the slider (left entry: bottom of range; right entry: top of range). Mean : the mean value of the interval in the selected channel. Std Dev : Standard deviation. Gives an idea about how homogeneous the distribution of values in the interval is. Median : For example, the value of the fiftieth peak in a 100 peaks interval. Pixels : The number of pixels in the active layer or selection. 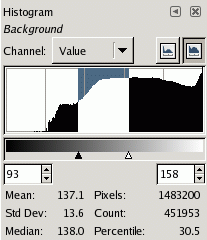 Count : The number of pixels in a peak (when you click on the histogram) or in the interval. Percentile : The ratio between the number of pixels in the interval and the total number of pixels in the active layer or selection.